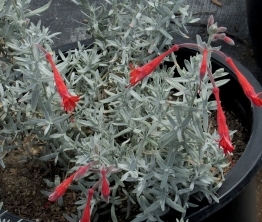 Zauschneria californica- one of our red flowering California fuchsia’s. Important part of the landscape since they flower from mid-summer through fall. Best results plant in full sun but will grow and flower in shade as well but can get a bit “leggy” in the shade. Hummingbird favorite.